SPADO is a research partner of Small Arms Survey (SAS) based in Geneva and has conducted research on the Prevalence and Impacts of Small Arms and Light Weapons in Federally Administered Tribal Areas and KP province. 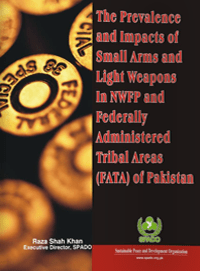 Another research focusing on Crimes Related to Small Arms in Peshawar was carried out and published. Presently we are conducting a research on the illicit arms transfers in Pakistan which will contribute to a background paper on global illegal arms trade.